Before we explain about your boiler losing pressure, we will give you just a little history. The combination boiler was invented in the mid 1800’s but not in the way we use it for central heating or hot water today, it was only in the early 1960’s that there was some serious inventions leading to what we have today. In the 1980’s the regulations changed, which then aloud us to have the first filling loop giving us pressurised water within our central heating system, which would bring the type of central heating mostly used today in the small to medium sized homes. Just below we have questions and answers you may be looking for in relations to your boiler losing water pressure in your central heating system. Why is my combination boiler losing pressure? 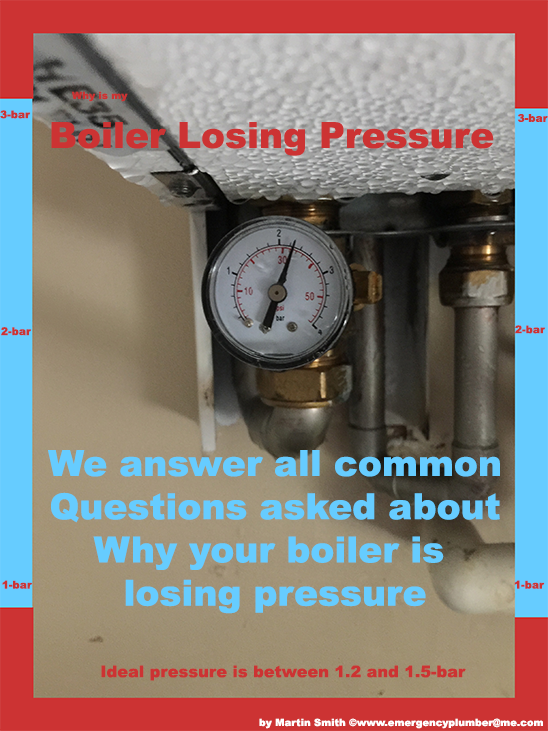 What causes the boiler to lose pressure? How do you stop a boiler losing pressure? Do I need a plumber to stop my boiler from losing pressure? Should I turn the mains water off if my boiler is losing pressure? How do I pressure my boiler back up? What should the pressure be on a combination boiler? If my boiler is losing pressure, could this be something to do with the boiler? What is the worse if my boiler is losing pressure? Boiler losing pressure, where is the filling loop? My boiler isn’t working, could this be due to the boiler losing pressure? Will the drip from the condensing pipe cause my boiler to loose pressure? If I have a leak from my central heating boiler, should I be losing water pressure? I’m unable to re-pressure my boiler, what can I do? I don’t have a leak, why is my boiler losing pressure? If my combination boiler is losing pressure, should the needle on the pressure gauge go down? Is it ok to over pressure my boiler if the boiler is loosing pressure? What are the normal faults to a boiler losing pressure? How long does it take to fix a leak if my boiler is losing pressure? How much does it cost to stop the boiler from losing pressure? It is simple to say that you have a leak on the combination boiler or the central heating system. Personally what I would do is look for a leak as can be seen visible, it may be useful to check the pressure release pipe that goes from the boiler to the outside but you MUST not place a cap on it as this will become a safety hazard. If your unable to find the leak visible the I would advice you call an emergency plumber that is gas safe registered. The cause of the boiler losing pressure can be due to wear and tear or an underlying fault on either the boiler or the central heating system. In most cases, we find that the central heating has been checked for air in the radiators or work for example a radiator has been taken of the wall. If the boiler is about 15 to 25-years old then there is a most likely possibly that the leak is coming from the expansion vessel or auto air vent. If there’s a fault with the vessel then you may find water coming from the outside pipe so check for any dampness. Looking for ways to stop the boiler from losing pressure, then you will need to call an emergency plumber (Gas Safe). If your looking to fix this yourself, don’t, you will most likely going to make it worse, which is the reason you are most likely not good at DIY as your reading these article or you may be attempting to solve the leak yourself, which may be illegal. To stop the boiler from losing pressure, you will most likely need a gas safe emergency plumber. If the engineer coming out is not gas safe, then don’t use them and ask them to kindly leave your property unless accompanied by a gas safe engineer. By attempting to do it yourself, you will most likely either struggle causing further problems or you may be breaking the law if your not gas safe. 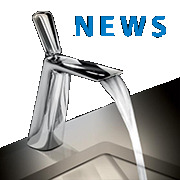 It is estimated that in 99.9% you will not need to turn your water off if your are losing pressure from the boiler, in the rare situation you will need to turn the mains water stopcock off is that the filling loop is left slightly on but will not turn off. To pressure the boiler back up, you will need to open the filling loop in order to let the water passed. If you don’t have a filling loop, you may have an alternative way of filling the central heating boiler pressure. To find out how to fill your boiler up other than using the filling loop, it is a good idea to check the manufactures instructions. The optimum water pressure on a combination boiler is at 1.3 bar but in most cases the engineer will tell you 1.5 as this is more easier to remember but is ok at this pressure. If your boiler is losing pressure, we would say that in Martin Smith’s experience, there is a 70% chance that the leak is coming from the central heating system rather than from inside the boiler but this can be open to those who are sceptical. The worse that could happen if the boiler is losing pressure, is that you will need a complete central heating system but before jumping to conclusions, this only happens in about 5% of plumbing emergencies an emergency plumber have to deal in. If your looking for the filling loop but unsure, the filling loop is most likely 99 out of 100 within a meter of the located boiler. This does not include any boiler that does have a filling loop at all and will most like have a filling valve underneath the boiler. If the boiler isn’t working, it is always a good idea to check the pressure on the boiler as this can be an indication to why the boiler isn’t working. You will normally find the needle on the pressure gage below the 1-bar which causes the safety device to turn the boiler off until the boiler is made safe meaning fixed and the boiler re-pressured. Where the drip comes from the condonsate pipe, this is not the water from the central heating system that is under pressure, the water dripping from the condonsate pipe is the condonsation from the flue. If you have a leak from the central heating boiler, this does not mean that you will be losing pressure as it could be the mains water pressure running through that forms a part of your hot water leading to the tap. In 99% of cases, as long as the pressure gage isn’t faulty, if you have a leak from the boiler and the needle stays at its pressure, then it is not a leak from your central heating water that is under pressure. If your unable to re-pressure your boiler even though you know how to, the pressure valve is most likely going to be faulty, if your good at DIY you will most likely try to fill up via the cold water mains connected to the radiator, but before you do this, don’t, you may be compromising the safety of the pressure gauge. If your pressure gauge isn’t working correctly, you may have too much pressure in your central heating system and will need it looking at by a gas safe emergency plumber. If you think you don’t have a leak and your boiler is losing pressure, then you are kidding yourself because water has to go somewhere, the water leak that you believe not to be may be hidden from visual sight, an investigation will have to be done by a competent emergency plumber. If the boiler is losing pressure from the boiler and the central heating system, bare in mind that the boiler and the central heating water share the same water, unless the needle is faulty, the needle will move depending to what the current pressure of the central heating water is. If your boiler is losing pressure, then it is NOT ok to over pressurise the boiler as this can lead to further problems associated to your boiler being over pressurised such as water passing through the pressure valve, sensitive parts that about to become faulty. The normal faults to a boiler loosing pressure is leaking radiator valves, getting rid of air within the central heating radiators can be another cause. In 30% of cases, losing pressure from the central heating system can be due to a faulty expansion vessel or a faulty auto air vent, which maybe caused by the faulty expansion vessel. To fix a leak, it all depends on the problem first but statistics say that the average leak is fixed within 20-minutes. On the unfortunate and unlucky situation, it can sometime result in a few days work. Depending on the labour rates, you will most likely find yourself paying for the minimum of 1-hour but it is always a good idea to expect the worse and hope for the best. If your looking for an emergency plumber that is gas safe and would like him to visit your home but don’t know where to look then feel free to give our company a call and we will send him straight over as an emergency plumbing call out. If your an emergency plumber and interested in fixing leaks due to the boiler losing pressure, then please feel free to check the plumbing register and register your details.